A woman visiting a wildlife park in Beijing, China, was killed over the weekend after she tried to save her daughter from a tiger attack. Her daughter sustained severe injuries from the incident. Badaling Wildlife World is a park that lets people drive through its Siberian tiger exhibit to view the captive animals. And this isn't the first time human blood has been spilled on the park's premises. One employee was killed by an elephant in March, a security guard was killed by a tiger in 2014 and a hiker was killed by a tiger in 2009 when trying to take a shortcut, according to the New York Times. But this park isn't all that unusual, according to critics. Wildlife parks across China are kind of a mess, according to Carole Baskin, CEO of Big Cat Rescue, a sanctuary for exotic cats in Florida. "The bigger picture, when it comes to tragedies in tiger parks in China, is that high-ranking officials, who control the State Forestry Administration [the government agency that oversees animal and environment issues], see tigers as a luxury product," Baskin told The Dodo. For example, tiger bone wine is a highly desired product in China, even though a ban is in place, Baskin pointed out. 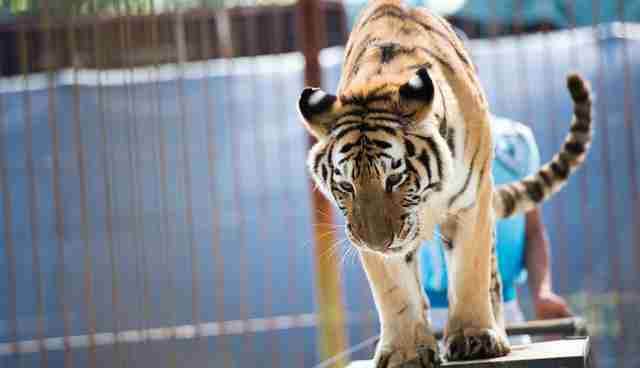 Currently, in China, an estimated 5,000 tigers are being raised in tourist attractions and "farms" in the hopes that the ban will be lifted. "China says we should farm tigers to take the pressure off wild tiger poaching," Baskin said, "but people will always want the premium product, which is the wild tiger, so stimulating demand is wiping out wild tigers." And the risks of keeping wild tigers captive have taken their toll across the country. Baskin cited many more examples, beyond the incidents at Bedaling Wildlife World, that suggest that the ethics of the captive big cat industry is tenuous at best. In May 2015, a lion was shot and killed after escaping his enclosure at Taian Tiger Mountain Park in the eastern province of Shandong. A 65-year-old zookeeper who sustained bites on his neck and shoulders later died from his injuries. 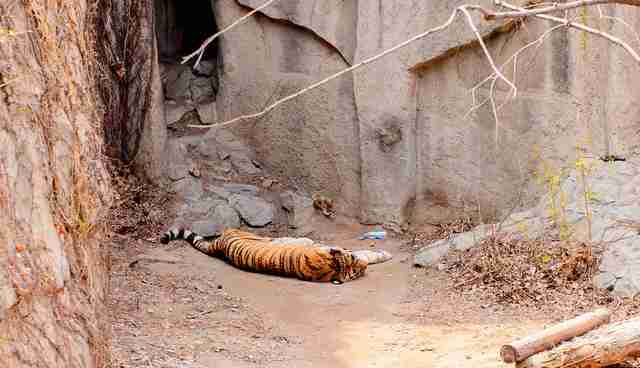 In March 2015, at a zoo in Yichun City, a zookeeper was attacked and killed by a tiger at the zoo after someone left the door to the enclosure open. In 2013, at a zoo in Shanghai, a 56-year-old zookeeper was killed when he entered a tiger's cage at the breeding facility to clean it. "The tiger had no prior record of aggression against people," Baskin said. This fall, Baskin and her team will be advocating for China to adhere to international regulations at the annual Convention on International Trade in Endangered Species (CITES). The CITES regulation stipulates: "Parties with intensive operations breeding tigers on a commercial scale shall implement measures to restrict the captive population to a level supportive only to conserving wild tigers; tigers should not be bred for trade in their parts and derivatives." "Tigers are used for petting, drive-through parks and pay-to-feed parks," Baskin said. "They're also housed in concrete cells to be starved to death for their bones." This latest tragedy is also raising questions about the risks people are willing to take to keep animals captive for human entertainment across the world. China might be a mess when it comes to tigers, but the U.S. isn't much better, since it's surprisingly easy to get a tiger in America. While the U.S. doesn't even know exact numbers, it's estimated that there are more captive tigers in this country (most in unaccredited institutions like roadside zoos) than there are wild tigers in the whole world. "We are so often exposed to a sanitized vision of wild animals, viewing them through glass and bars as they languish in captivity, that it seems we are forgetting that they are unpredictable, powerful and inherently dangerous," Kate Dylewsky, program associate at Born Free USA, told The Dodo. "This bizarre comfort with being near exotic animals has led to one tragedy after another, including the death of a woman who exited a car in the middle of a tiger enclosure in China." The very model of these kinds of parks normalizes an interaction that is actually abnormal, according to Dylewsky. "Society loses sight of the fact that it is never safe to be near tigers," she said. "The accessibility of these animals in captivity may seem like simple entertainment, but it comes at a troubling cost. Exotic animals should be allowed to roam free in their natural habitats; it is safer for both us and them." That tigers have little natural habitat left is a tragedy of another kind. Click here to urge the U.S. government to ban close contact between the public and wild animals.